I will be rooting for the Indians this year. However I like both squads. One of the reasons that I will be cheering for Cleveland is that their manager led some very bad Phillies teams in the late 1990s. In my opinion he took a little to much heat here for that lack of success of those teams. However....I believe the Indians are way overmatched, I predict the Cubs in a quick four games. MVP goes to Ben Zobrist. First the Nobel prize folks give Bob Dylan an award, now the committee is upset that the iconic troubadour won't return their calls. The Nobel news got me curious about Bob Dylan trading cards which led me to this interesting find. Here in Philadelphia there is a venerable shed called the Mann Music center which hosts a summer concert series. The last couple of years the Mann has commissioned illustrator Alex Fine to design baseball card inspired artwork for their shows. The above card of Bob Dylan bears a resemblance to 2003 Topps right down to the Baseball field in the lower corner. However the Mann card has the icon in the lower right rather than lower left. I do like that Fine used the Phillies Red White Blue color scheme, and chose the liberty bell as a logo. The red background running the full width of the card is from 1963 Topps as is presenting the Surname in larger font then the first name. The many acts for which Mann cards have been created include Robert Plant, Phish, the Monkees, John Fogerty, Tedeschi Trucks Band, Ray LaMontagne, Norah Jones, Steely Dan, Bare Naked Ladies, Weird Al Yankovic, Faith No More and several others. I am no experts on the fine arts, and know significantly less about literature than I do about how Baseball-Ref calculates WAR. Regardless I did find it odd that Dylan was given the honor. The Nobel's I am most familiar with are Peace and the Science oriented ones which I have always assumed were given to folks connected to contemporary events and solving problems of the present era. Near as I could tell Dylan's recent catalog was not any more significant than any recent era - and definitely not as significant as say his 60s output. However I did some digging. Turns out I know very few Nobel-Lit winners. It appears the Nobel Lit is a bit of a lifetime achievement award. The most recent winner that I had heard of was Alice Munro (2013). There are several other winners over the last few decades who I knew by name but not by product: Doris Lessing (2007), Harold Pinter (2005), Toni Morrison (1993), Saul Bellow (1976), Pablo Neruda (1971). You have to go clear back to 1962 to find someone who wrote something that I actually read, John Steinbeck - and the book I read was NOT "The Grapes of Wrath" - It was "the Pearl" which I read over 30 years ago in either High or Middle School. The selection was solely based on the fact that it was the shortest book on the reading list we were given. Bowa's 1975T All-Star swatch honors his start in his start in the 1974 Mid-Summer classic hosted by the Pirates. 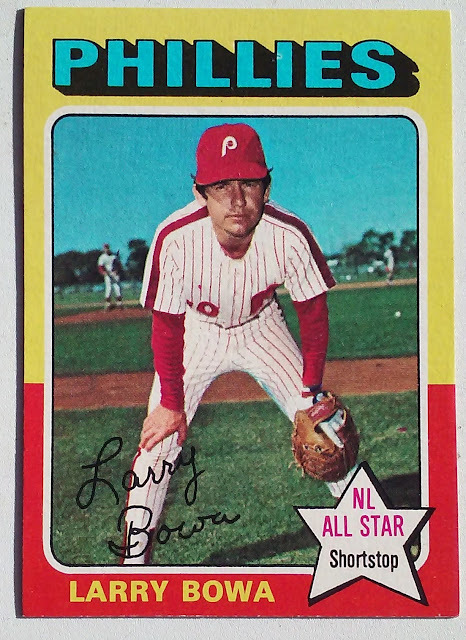 As a batter the most successful ASG for Bowa was 1978 when he went 2 for 3 and scored a run. All five of his appearance came as a Phillies player and the NL won each of those games. 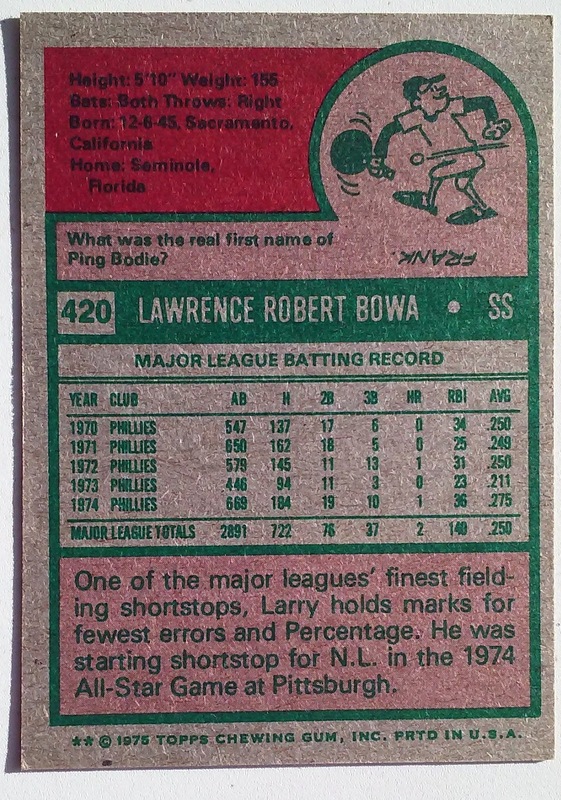 The back of Bowa's card mentions his 1974 All-Star Appearance in Pittsburgh along with Bowa's early career fielding accomplishments. A note on the cartoon, Ping Bodie, The man has a pretty interesting SABR Bio. First off his official name contains neither Ping nor Bodie. He was born Francesco Stephano Pezzolo - through a series of events his name evolved to Ping Bodie. Among other tidbits found in his Bio is that he swung a 52 oz bat and roomed with Babe Ruth when he played for the Yankees. In the film "the Babe" Ping was portrayed by horror movie actor Ralph Marrero. It was Marrero's last film as he died in a car accident prior to the movies release. With the Dodgers hosting the Cubs during the middle games of the NLCS we turn to one of the LA representatives for our 1976 All-Star Game retrospective. 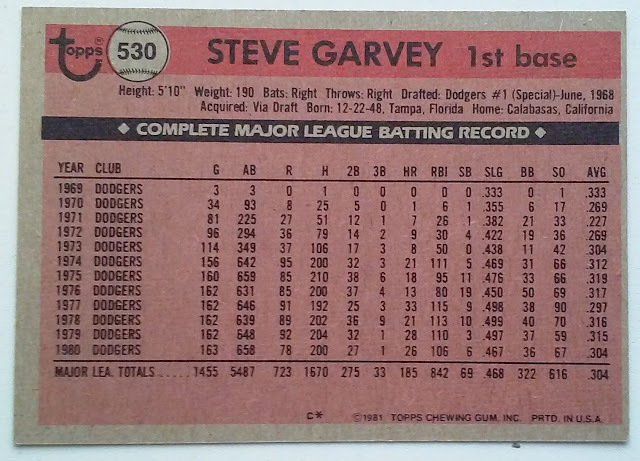 In 1976 Steve Garvey made the third of his ten All-Star teams. He was the only infielder that represented a team other than the Reds. Garvey went 1-3 in the 1976 All-Star Game. In the first inning he picked up an RBI on a triple off of Mark Fidrych and later scored on a ground out by George Foster. The two runs gave the NL Squad a 2-0 lead which they never relinquished in the 7-1 victory. 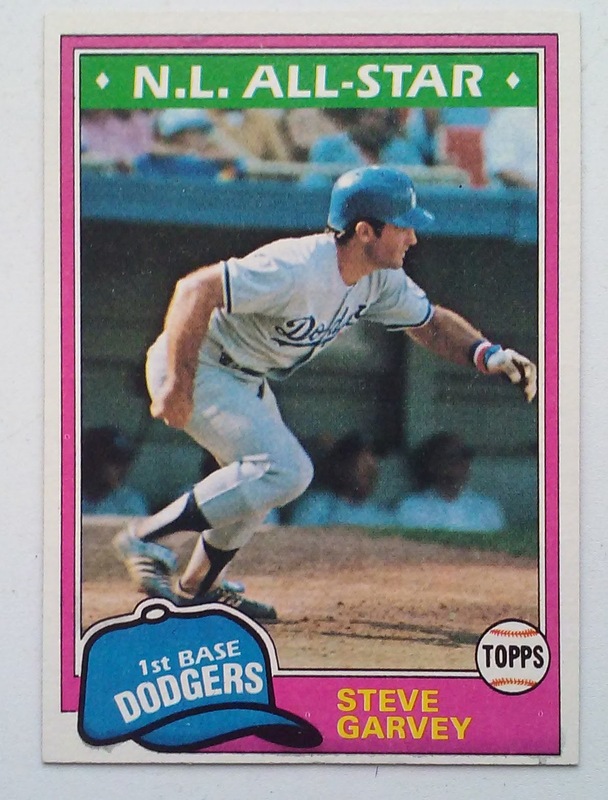 Steve Garvey always liked the bright lights of big games. He was the MVP of two all-star games (1974 and 1978) as well as a pair of NLCS - 1978 versus the Phillies, and 1983 with the Padres vs the Cubs. Just one thing I wanted to note from the back - check the Games Played column. 1980 was the last of six consecutive years that Garvey would play 160 games or more. He played only 110 in 1981, but that was because of the strike. He would return to play the full 162 the following season. Garvey started a consecutive games played run on September 3rd 1975 that would continue until 1983. The streak reached 1207 games on July 29 1983 and ranks fourth on all-time list. Things been busy here at Phungo HQ and I sort of abandoned our 1976 All-Star Game series around the time of the games Anniversary in July. I wanted to get to all the HoFs and Philllies in the game this year and will do my best to clean up the rest of the profiles in the coming weeks - although I may mail in some of the offerings. Today we are discussing Phillies second baseman Dave Cash. 1976 was the third and final appearance in the mid-summer classic for Cash, in each of his three appearance he was the back-up behind future hall of famer Joe Morgan. Cash was the only Phillie to get a hit for the Home fans in 1976, He singled off Frank Tanana to lead off the eighth inning and later came around to score on a Ken Griffey base hit. Since he was never a starter Cash never got a Topps card with an All-Star flair. I chose a 1993 Retro card from UD to represent Cash. Nice to see a semi-star like Cash get the retro treatment. You may need to click on the above images to expand the the cards (and the text) to view them more clearly. Although Cash is featured in his Phillies threads on the front of the card, the first panel discusses his exploits with the Pirates in the 1971 ALCS. UD finally gets to the Phillies on the middle panel. Interesting tidbit here is that the Cash's All-Star 1976 season is mentioned along with his low Strikeout (13) total. In the "Things have Changed" department, last year among players that had a similar K total or less only two had over 100 ABs Yulieski Gurriel (130 AB) and Mike Moustakas (104 AB). Cash totaled 666 ABs for his 13 Ks. The final Panel reference BAT (Baseball Assistance Team) an organization that helps current in former players in need of Assistance. The organization is still functioning today and a number of testimonials can be found on their website. A few weeks ago Paul Hagen posted an article on Dave Cash at MLB.com. 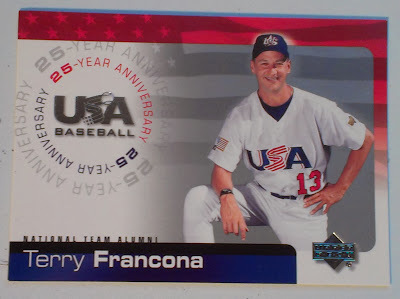 It sounds like the Phillies former second baseman who is now 68 years old is enjoying a relaxing retirement. On October 13th Music Icon Paul Simon will be celebrating his 75th birthday. I don't believe there are any Paul Simon cards in the Phungo collection, however I think we have found a worthy substitution. 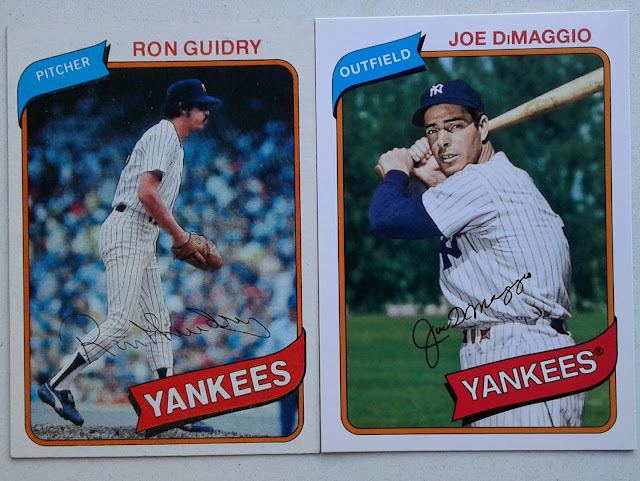 I also don't have any Joe DiMaggio cards from his active years (likely out of Phungo budget ranges), but I do have a handful of retro cards of the Yankees legend. 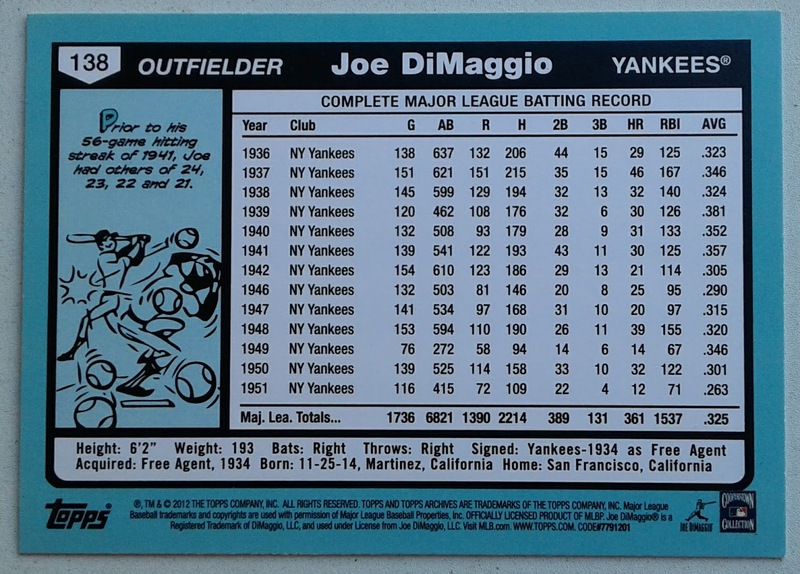 As I am sure most folks are aware DiMaggio is named dropped in Simon's song "Mrs Robinson" from "the Graduate". Paul Simon is still a baseball fan, earlier this summer he was shown on TV at an Orioles game after being spotted the previous day in Pittsburgh watching the Pirates. Pretty cool trip for any fan. The day Paul Simon was born Joe DiMaggio was enjoying one of the first few days off following his celebrated 1941 season. That was the year DiMaggio authored his 56 game hit streak while on the way to his 2nd of 3 MVP awards. The streak was so Compelling that DiMaggio won the MVP award over Ted Williams who hit .406 in 1941, a mark that has been unmatched since. The Hitting streak is noted in the cartoon on the back of the archives card. A solid choice with some rather fun artwork. The Archives card draws from Topps 1980 issue. For Yankees cards the homage is satisfactory, the design and colors definitely evoke the original. If one were to quibble I supposes there could be complaints about the font sizes of the text on the two pennants, but I think it is close enough for Archives. I am sending out a big Thank You to the fine crew over at the Phillies Room. All season long Jim has has been keeping his eye out for Phillies Topps Now cards. He has been picking them up in bulk and passing along a card to Phungo HQ. While not a Phillies card this is certainly one in spirit. There are very few folks Phillies fans are going to miss more than Chase Utley. I am glad to see him in the postseason even if it is with the Philllies west coast rival from my youth. There are a number of things I love about this card. 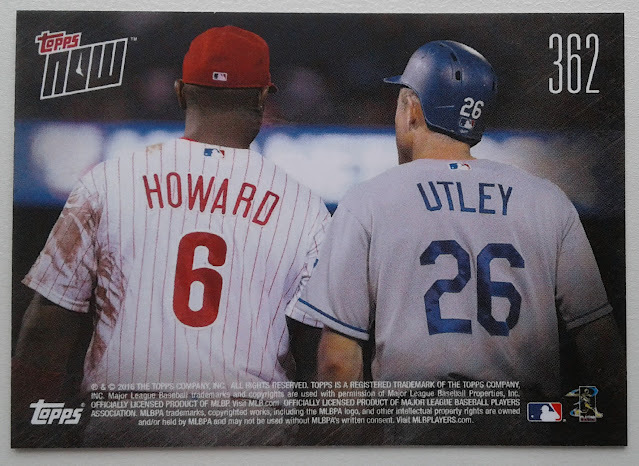 This is the kind of even that Suits Topps Now well especially for a club like the Phillies who are a bit short on highlights for the 2016 season. The card also represents a Phungo Game. It was a 15-5 Phillies loss, but I definitely had a good time, you can read more about the game here. 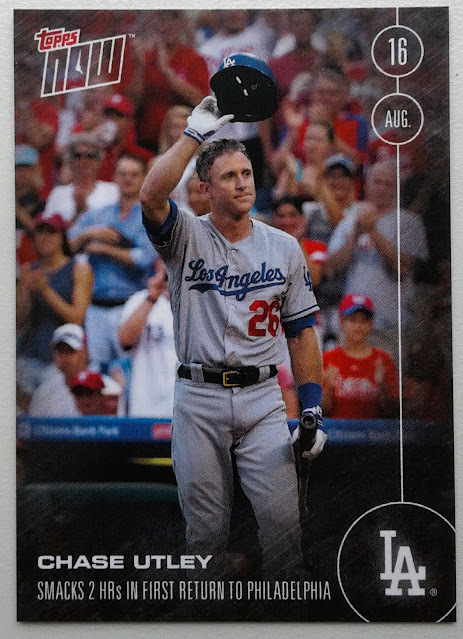 Typically I like some interesting copy on the back of the card, but I think Topps makes the right decision here. Sometimes you can say everything without saying anything at all. 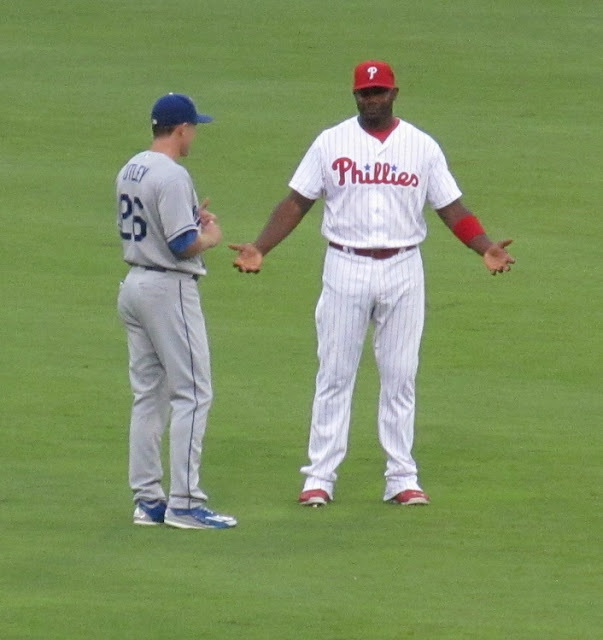 I tried to capture a similar idea with this Photo I took at the Utley Return game. I like taking two player photos especially of opponents. It is interesting to see what relationships exist within the sportsworld. Both of the images on the Topps card were captured by Philadelphia based Photographer Mitchell Leff. The Front of the card is here and the back here. October 8th marks the 60th Anniversary of Don Larsen's perfect game, which he threw in Game 5 of the 1956 World Series. 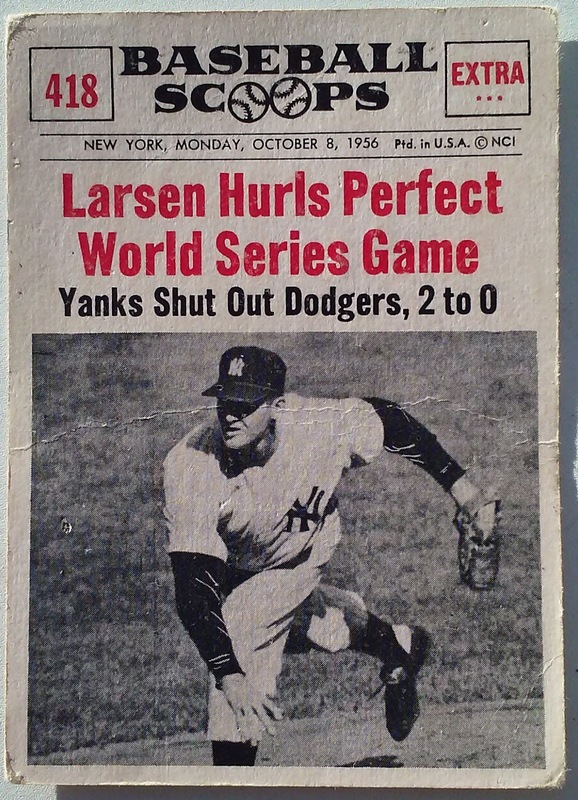 Larsen and the Yankees defeated the crosstown rival Brooklyn Dodgers 2-0 that day. Offensive Heroes including Mickey Mantle who clubbed a fourth inning Home Run and Hank Bauer who plated the games other run with a single in the sixth. The event was honored by this beautiful 1961 Basesball Scoops Card. Nice touches include a decent photo for the era and a date line specific to the game. I am also a fan of the title logo which contains the bouncing baseball iconography rather in place of the OOs in scOOps. The pivotal game five victory gave the Yankees a 3 games to 2 advantage over the Dodgers in a Series that would eventually go the distance. The Yanks won game 7 and Larsen took home MVP honors. Great back of the card for a game that certainly warrants the attention. Four Paragraphs of text! Some of it is a little awkward - the 2nd Paragraph has two sentences that essentially state the same fact about 3 ball counts. Pee Wee Reese's first inning AB is mentioned both here and in the final paragraph. Regardless I still love the card. 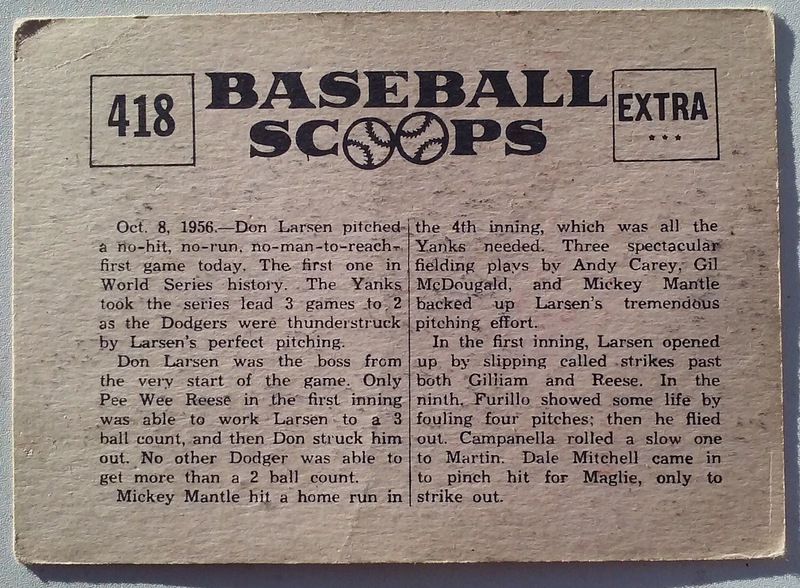 Topps honored Larsen with a similar card in their 1961 set which can be found here.